Sweetie-pie classics touched by Raina’s graphic magic. Pocket smiles! What’s even better than a Baby-Sitter’s Club story filled with fun and friendship? 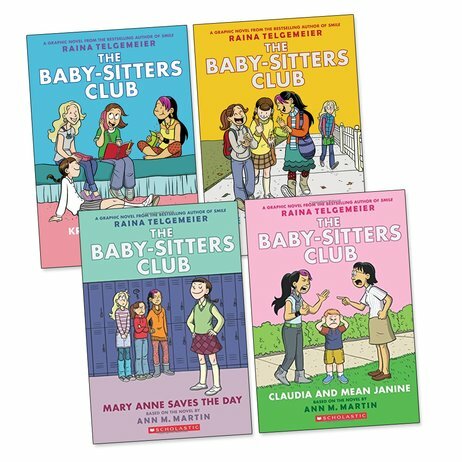 Four stories turned into graphic novels by cartoon queen Raina Telgemeier – author of Smile, Sisters and Drama. Do say OMG! The Baby-Sitters Club is Kristy’s great idea. A cool way to make friends, build life/career skills and earn a bit of cash. Nice! Errr – hang on. Strict parents, cranky kids, timetable clashes, fashion horrors. Was this really such a great idea? You’ve just gotta have faith!